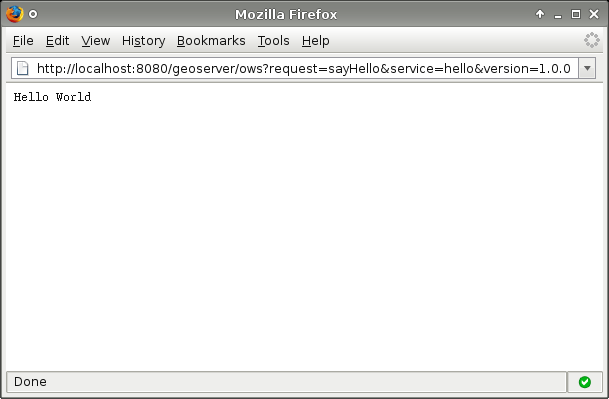 This section explains How to Create a Simple GeoServer OWS service for GeoServer using the following scenario. The service should supply a capabilities document which advertises a single operation called “sayHello”. The result of a sayHello operation is the simple string “Hello World”. The first step in creating our plug-in is setting up a maven project for it. The project will be called “hello”. Create a new directory called hello anywhere on your file system. A plug-in is a collection of extensions realized as spring beans. In this example the extension point of interest is a HelloWorld POJO (Plain Old Java Object). The service is relatively simple. It provides a method sayHello(..) which takes a HttpServletRequest, and a HttpServletResponse. The parameter list for this function is automatically discovered by the org.geoserver.ows.Dispatcher. Create an applicationContext.xml declaring the above class as a bean. If you are running a GeoServer in Tomcat, copy target/hello-1.0.jar into webapps/geoserver/WEB-INF/lib (just like we manually install extensions or community modules). Restart GeoServer to pick up the change. After editing webapps/pom.xml we need run mvn eclipse:eclipse , and then from Eclipse right click on web-app project and Refresh for the IDE to notice the change. A common pitfall is to bundle an extension without the applicationContext.xml file. If you receive the error message “No service: ( hello )” this is potentially the case. To ensure the file is present inspect the contents of the hello jar present in the target directory of the hello module. An alternative to plugging into an existing installation is to build a complete GeoServer war that includes the custom hello plugin. To achieve this a new dependency is declared from the core web/app module on the new plugin project. This requires building GeoServer from sources. Build GeoServer from sources as described here. Install the hello module as above. A GeoServer war including the hello extension should now be present in the target directory. To verify the plugin was bundled properly unpack geoserver.war and inspect the contents of the WEB-INF/lib directory and ensure the hello jar is present. During development the most convenient way to work with the extension is to run it directly from sources. Setup GeoServer in eclipse as described here. Move the hello module into the GeoServer source tree under the community root module. In eclipse import the new hello module and refresh all modules. In the web-app module run the Start.java main class to start GeoServer. Ensure that the web-app module in eclipse depends on the newly imported hello module. This can be done by inspecting the web-app module properties and ensuring the hello module is a project dependency.